Evictions for no-cause and out of control rent increases are taking a devastating toll on Oregon's communities. Under current Oregon law, families across the state who have paid their rent on time can still be kicked out of their homes without cause and through no fault of their own. No-cause evictions are often used as a smokescreen for retaliation against renters who ask for repairs or are a member of a protected class. Limitless rent increases are straining already cost-burdened families trying to make ends meet. The stability and security of the nearly 4 out of 10 Oregonians who rent their homes depend on legislators standing up on their behalf. Learn more about the solution to Oregon’s housing crisis in an opinion piece from Charlie Harris, a retired housing developer who worked on affordable housing for farmworkers and low-income families in rural Oregon. Thank you to everyone who stood up and spoke out on Presidents’ Day. 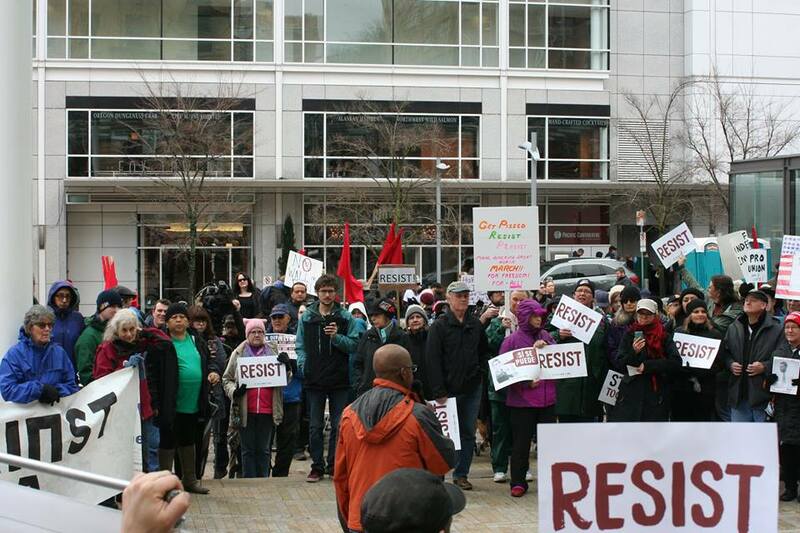 Working people throughout Oregon attended a series of rallies and marches to stand in solidarity against attacks on the rights of immigrants, refugees, workers, people of color and the LGBTQ community. We gathered to educate the community about our issues, because without a proactive, positive response we will not see the changes we need. We gathered to resist hate, and resist rhetoric and policies which embolden hate and threaten the rights of those in our communities. The emboldening of hate has hit close to home: in the month following Election Day, Oregon was the tenth-highest state for incidents of hate and hate crimes. When community-based organizations and labor unions march together, we send a message of united resistance against hatred, against oppressive policies and against attacks on our rights. Those attacks include the ban on immigrants and refugees along with increased ICE raids, any rollbacks on rights for the LGBTQ community and Congressional legislation designed to limit the ability of working people to stand together as unions. We will continue to work together as a movement to protect the rights of Oregonians. Congress is in recess, and there are events statewide to participate in. This is an opportunity to ask questions and learn more about our elect leaders’ work in Washington DC. Thursday, February 23 at 9:45 a.m.
Thursday, February 23 at 5:00 p.m.
Saturday, February 25 at 10:30 a.m.
Saturday, February 25 at 2:30 p.m.